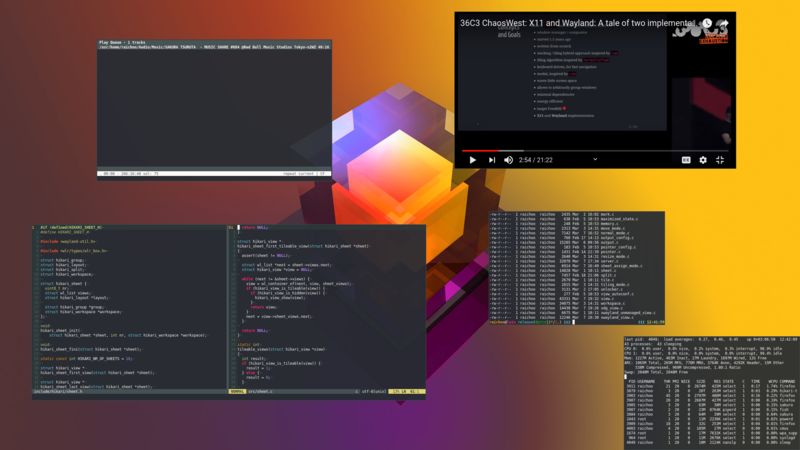 hikari is a stacking window manager with additional tiling capabilities, it is heavily inspired by the Calm Window manager (cwm(1)). Its core concepts are windows, groups, sheets and the workspace. The workspace is the set of windows that are currently visible. A sheet is a collection of windows, each window can only be a member of a single sheet. Switching between sheets will replace the current content of the workspace with all the windows that are a member of the selected sheet. hikari has 9 general purpose sheets that correspond to the numbers 1 to 9 and a special purpose sheet 0. Windows that are a member of sheet 0 will always be visible but stacked below the windows of the selected sheet. Groups are a bit more fine grained than sheets. Like sheets, groups are a collection of windows. Unlike sheets you can have a arbitrary number of groups and each group can have an arbitrary name. Windows from one group can be spread among all available sheets. Some operations act on entire groups rather than individual windows. Copy config.def.h to config.h and customize it for hikari to fit your workflow. Build hikari by running make. hikari officially only supports FreeBSD and OpenBSD at the moment. To build on OpenBSD run sed -i s,local,X11R6,g Makefile first. Building the hikari manpage requires pandoc. To build the manpage just run make man VERSION=0.0.1, where VERSION is the version number that will be spliced into the manpage. To get rid of any build artifacts run make clean. I'll be very careful with accepting outside patches since this project is mainly driven by my own needs. If your patches do not get accepted feel free to maintain your own branch of hikari. If you have any questions you can contact me via E-Mail or Mastodon.